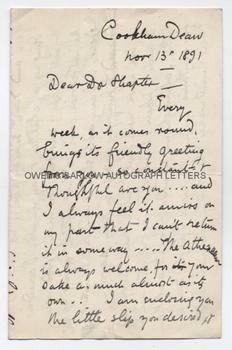 SIR GEORGE CLAUSEN Autograph letter Signed. British (English) artist and Royal Academician who was one of the foremost British painters of landscapes and peasant life. ALS. 4pp. Cookham Dean. November 13th 1891. To Dr. [Thomas] Shapter. A fine early letter. "Every week, as it comes round, brings its friendly greeting from you - so consistent and thoughtful are you . . . and I always feel it . . . on my part that I can't return it in some way. The Athenaeum is always welcome, for your sake as much almost of its own. I am enclosing you the little slip you desired and take the opportunity of giving you our little gossip. It is very little: our life goes on quietly. My days are spent in work; a constant struggle to express myself - and I find, as time goes on, that it becomes more and more difficult to attain anything really good. I suppose this is owing to the wider outlook that increased knowledge brings. For I am conscious of having made considerable advances in my work. For the rest; the L.S.D. point of view, I am no nearer to fortune than 5 or 6 years ago - and don't expect to be. So long as I can bring up my children and pay my way I consider myself lucky, knowing how many good men in the profession can't do this without giving up their ideals. I am able still to hold on to mine and look forward to justifying myself in them, soon. We have now five little ones! 3 boys and 2 girls! When I think of it, it frightens me a little, although we wouldn't be without them for anything. My wife I'm glad to say is well and wishes to be kindly remembered to you. I haven't yet any great work finished. All I have got through is small. As we are still in an unsettled state, looking out for another house, I hardly feel like beginning on a large canvas . . . And how are you? Well and tranquil I hope. I suppose you will have painted but little lately. Do you still take your walks? I am sending you a little token - a photogravure of one of my pictures; will you accept it in friendship - and believe me dear Dr Shapter, with all good wishes to you [etc]". An excellent letter written by George Clausen when still a relatively young man of 39. George Clausen is noted for his paintings of landscapes and rural and peasant life. His style shares something with the impressionist painters of the period. He eschewed more lucrative painting genres and remained true to his art. George Clausen was to achieve a considerable reputation as one of the foremost British landscape painters and in 1906 he was made a full Royal Academician, later becoming professor of painting at the Royal Academy School. He was official war artist in WW1. George Clausen was knighted in 1927. From a 19th century collection made by a daughter of Thomas Shapter, the Exeter surgeon and pioneer epidemiologist, noted for his book on Cholera. It appears from Clausen's letter that Shapter was also an amateur painter. It is likely that Shapter was also a patron of the young George Clausen and other letters from the same source indicate that the family were astute buyers or commissioners of other artists work, including Sir William Boxall and Philip Hermogenes Calderon.